The first thing everyone notices when they get this out of the box, is just how good it looks. Not exactly tiny, this weighs in at around 45 pounds (ok, its a monster), give or take a few and has a painted metal exterior with a stainless steel shell. It does not look like something you would want to mess with and it certainly isn’t going to fall over easily. It looks smart and professional and you just know it will to look impressive sat on your kitchen workspace. So, what can this slightly intimidating box of tricks do? Maybe it’s quicker to list what it doesn’t do! 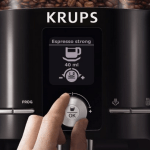 Coming equipped with seven individual programmable buttons for making, caffe, espresso, caffe lungo, latte macchiato, cappuccino and hot water. This machine can remember your preferences and so you can custom make your own drinks, your own way. Other features that stand out include the detachable milk carafe, meaning milk can be stored in the fridge when the unit is not in use and does not remain within the body of the machine, going rancid and icky. There is also automatic cleaning of the milk unit after each use. 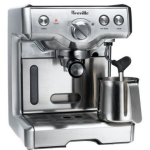 It has two separate boilers, for brewing and steaming, so that you can complete both tasks at the same time and with no loss of water/ pressure. Not only can this baby freshly grind coffee beans, but it can also let you opt to use ready grounds if you so wish to, by using the doser bypass. This might be handy especially for lovers of decaff or specialty coffee blends. When it comes to cleaning and maintenance, there is an automatic alert when your machine needs to be de-scaled and for when the drip tray or dregs drawer need emptying. It also tells you when the hopper needs replenishing. Obviously, the key word with this machine is automatic. You are not going to be messing about here. If you simply demand perfect espresso and milk based coffees without the fuss, but want the full experience, this is very much for you. SO WHAT DO WE LIKE ABOUT THIS MACHINE? There is a lot to like here. This reviewer finds that here we have a presentable, swish and capable looking workhorse, that doesn’t appear like a knackered donkey or burdened mule, but isn’t as temperamental as a thoroughbred. 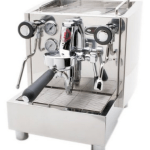 It is height adjustable, accommodating from a 3 to 6.5 inch clearance, has two boilers and a separate unit for the milk, which can conveniently be removed and stored in the fridge when not needed. There’s digital display to tell you where you are at with your brewing and automatic reminders to do important stuff like the dreaded de-scaling. It’s good and fast and has some impressive timescales for producing your standard eight ounce beverage size (57 seconds for brewing and 81 seconds for steaming). Pleasingly, it comes with some reassuring testimonials about its longevity. It may not last forever, but it shouldn’t be leaving you in the lurch in a hurry either. 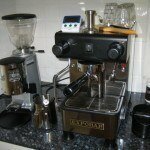 You can choose between freshly grinding beans and using ready bought or ready made grounds. There’s a good choice of beverages that can be made, as well as having hot water on demand. Two boilers means brewing and steaming do not have to impact on each other and the icing on the cake – the grinder is made of ceramic, giving it the edge, we feel, over some of the competition, perhaps. SO WHAT IS LESS THAN PERFECT? Time to have a look at what the complaints are. Truth be told, overwhelmingly, there seems to be an issue with the temperature of the drinks, namely, the correct heat of the milk. Although some do feel that the drinks this machine produce are plenty hot enough, there are other dark murmurings about needing to microwave them to bring them up to the required temperature. When it comes to the temperature of drinks, there is often a stark polarity on this issue, with some folks wanting molten lava plus caffeine and others preferring something that can actually be imbibed without an esophagus transplant. It should be pointed out that this machine does come with a cup warming facility, which may help improve the outcome of the drink considerably. Also, it is possible to tinker about with the settings to ensure the hottest possible option for both water and milk. Finally, patience is a virtue, do allow the unit long enough to complete its initial “warm up” procedure. The bottom line does seem to be that milk based drinks will need manual steaming or warming separately, though. Anything else you should know? Some people feel the water reservoir capacity could be a little larger, particularly if you wish to brew a lot of drinks in one go (presumably the whole point of a machine like this). On the other hand, it could be argued that there’s less chance of water sitting about going stale in the unit. Overall, none of the problems associated with this product are insurmountable ones. 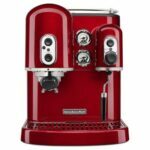 The Gaggia Academia Espresso Machine would seem to be a decent, reliable automatic machine, which is easy to use and also easy on the eye. It needs some regular maintenance though, as you may expect and the machine will help prod you when you need to do it. 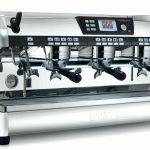 Automated but customizable, this will produce excellent quality coffees at the literal touch of the button. The problems it may have are fairly small, but perhaps some feel that they should be none at all considering the hefty price tag. All in all, this is a good choice to make if you are willing to spend the money.